Mein armer Sauerteig musste ganz schön leiden. Ich habe den Ansatz seit letztem Oktober mehrmals getötet. Aber jetzt habe ich Besserung geschworen und versuche wieder regelmäßig zu backen. Meiner Meinung nach ist Sauerteigbrot einfach am besten. Und es hält sich ja auch viel länger als Hefebrot. Alles in eine Schüssel geben und gut vermischen. Mit einem Teller oder Folie abdecken und 12-16 Stunden ruhen lassen. Der Vorteig ist fertig, wenn sich das Volumen verdoppelt hat, er schön Blasen wirft und angenehm sauer riecht. Alles mit der Hand eine Minute lang gut kneten. Wegen des vielen Wassers (und natürlich auch wegen des Roggens) ist dieser Teig klebrig und nicht besonders geschmeidig. Abdecken und zehn Minuten ruhen lassen. Dann wieder eine Minute kneten. Eine Kastenform mit Backpapier auslegen und Teig hineingeben. Mit einem feuchten Küchentuch abdecken. Den Teig gehen lassen, bis sich das Volumen verdoppelt hat. (Das dauert je nach Sauerteig 1-2 Stunden.) In der Zwischenzeit den Backofen auf 220°C vorheizen. Das Brot in den Ofen schieben und 10 Minuten backen. Temperatur auf 200°C absenken. Brot weitere 30 Minuten backen. Thank you! I just baked my first loaf ever using this! Came our delicious :) Just had one problem. I’m not sure what German parchment paper is, but I interpreted it as American wax paper. The paper baked right into the side and bottom of the loaf! Easy enough to cut off though. That is great to hear, Steve! Sorry your paper got baked in. German parchment paper is the same as every other parchment paper and it is definitely not the same as wax paper. You should never bake with wax paper:) I am sorry about the confusion. Thanks for the recipe! Not sure if you check this often since it is an old post, but do you think adding oats and seeds would work in this recipe? I plan on trying it, just wanted to see if you had any thoughts on changes that may be required for these additions. Hi Amanda, yes it would work! Substitute some of the flour (by weight) with your oats. Hi Gina, sorry for getting back so late. The bread recipe that comes with my starter is a recipe for a brand new starter. Often these starters just don’t have that much yeast yet. They just don’t work that well yet. (Usually – sometimes they do.) Therefore you can use a lot more starter. That recipe is only for a brand new starter and it’s also a way to actually use all that excess starter that builds up in the process of making it and that you’d usually discard. A regular sourdough bread is made by refreshing a regular mother starter. If your starter works the way it should and is strong enough, a tablespoon taken from your mother starter is enough to make a fresh batch of starter for your recipe. If you want to make this recipe with a brand new starter and it won’t rise, you can also add a teaspoon of instant yeast to the bread dough to get it to rise properly. I’ve never frozen a starter, but you can definitely dry it for later use. Spread a very thin layer on a piece of parchment and let it dry. Then pulverize it and store it in an airtight container. To use it, you just have to mix it with water and flour. That mixture has to sit for a couple of hours and then get back to life. Works like a regular starter. In German we have all kinds of terms for this. In English I sometimes lack the words but I hope I could make this clear? If not, please don’t hesitate to ask again. Please could I ask about the amount of starter to use? When you say tablespoon do I get my measuring spoons and measure a flat tablespoon of it, or do I just get a spoon I’d eat dessert with and get a spoonful of my starter with it? I’m wondering as I did the first one which would be less of the starter and it’s nearly 12 hours in a warm room and it hasn’t grown or bubbled at all. Thanks. I use a spoon I would eat soup with. it doesn’t have to be super accurate. The most important part is that you have a well working, active starter. If nothing happened after 12 hours, the starter you used wasn’t strong enough. How do you usually refresh your starter? Thanks for quick reply. I probably didn’t use as much as you do then. I refreshed my started 24 hours before using by throwing away half and replacing with 40g rye flour 40ml water, and when I came to use it there were quite a few bubbles going on. Did your refreshed starter rise, too? If not it probably wasn’t strong enough. If you want to make this bread, you don’t have to follow my tablespoon refreshing method. You can also refresh as you usually do, just make sure that you have the same amounts of ingredients (250g flour, 300 ml water). Hi, I want to make a 30% rye, 70% white spelt sourdough loaf. What adjustments to water and kneading method would you recommend? That depends a lot on the properties of your flour but I would guess that you might need less water. I’d start out with 300-350 ml water and then adjust the measurements. Sorry to hear that Kristen! Hope you have better luck if you decide to make this again. Hi Mihl, your new format looks beautiful! Many of us fall off the bread wagon I suppose. I love baking bread, but then I eat it all! I do make my own pizza dough, which is fun. Hope you’re well! Your bread looks delicious Mihl! I feel like I’ve been on a bread baking hiatus as well, it’s been ages since I’ve made any. I’m so going to make this bread! I’m a huge fan of sourdough and just revived my starter. What a gorgeous loaf. Mihl – you always make such beautiful bread. Homemade sourdough is one thing I miss since going gluten-free. As for your bread-baking skills, you may have lost the starter and some of the energy, but clearly the skills are still intact! I love sourdough bread, too. 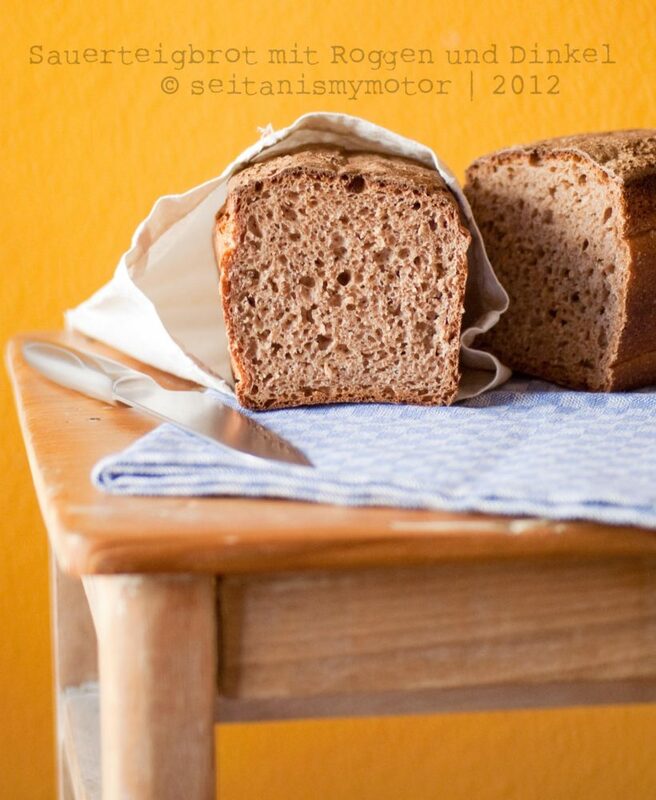 Your rye and spelt loaf looks fantastic! The Bread Basket — just seeing those words made me smile, because I love your bread recipes! I’ll be making this bread pronto — well, as soon as I get a rye sourdough starter going. I haven’t had a starter hibernating in my fridge since I found out about my wheat allergy, and it never occurred to me to make one with rye.